SPRINGFIELD, NJ, Feb. 23, 2011 – Operating engineers Local 825 praised Spectra Energy (NYSE SE) for its update to the Jersey City Council last evening on its proposal to build a natural gas pipeline through parts of the city. “We were pleased that at least half of the people who attended tonight’s meeting support the project, which would be a boost to the local economy and job opportunities,” said Greg Lalevee, Local 825’s business manager. SPRINGFIELD, NJ, FEB 14, 2011 – Construction on a pipeline that would bring clean energy and more than 5,200 jobs to New Jersey should be allowed to begin, according to Local 825 of the International Union of Operating Engineers. Representing more than 6,500 heavy equipment operators in New Jersey and parts of New York, Local 825 is urging federal, state and local officials to approve the project without costly delay. SPRINGFIELD, NJ, Feb. 14, 2011 – Construction on a pipeline that would bring clean energy and more than 5,200 jobs to New Jersey should be allowed to begin, according to Local 825 of the International Union of Operating Engineers. Local 825 publishes its new website, addressing the interests of members, contractors, community groups and public officials. The sitel showcases the Local’s capabilities and contributions to our local economies and it establish the advantages employers enjoy when they use our Operating Engineers. New leadership, new focus for 2011. 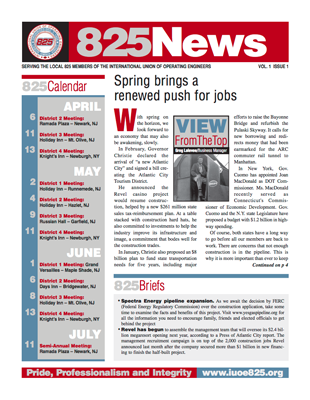 Local 825 begins the new year with a drive to restore its role in New Jersey labor initiatives, advocating for new ways to promote employment and informing the business community of its vital contribution to the local economy. The Port Authority of NY/NJ has announced plans for the Bayonne Bridge Project.The thousands of jobs at Port Newark-Elizabeth’s container shipping facility represent a vital economic engine for our region. The Port’s future depends upon an ability to receive larger ships. Port Newark-Elizabeth is among the largest shipping hubs in North America and needs to maintain its competitive advantage. Had the Port Authority chosen not to allow access to these larger ships, countless dollars of economic activity and several jobs might be lost to other competing ports. Read more. The PurGen One Project will create over 9,000 jobs in New Jersey during construction! PurGen is an Integrated Gasification Combined Cycle (IGCC) power plant, with carbon capture and sequestration, to be located in Linden, NJ. Easily available coal arrives by rail or barge and is then converted to a synthetic gas. During this process, harmful sulfur and mercury is safely removed. Carbon dioxide is then separated and safely stored deep under the earth’s surface far offshore. PurGen will help reduce our state’s dependence on dirty coal plants in and out of New Jersey, helping improve our region’s air quality. PurGen is NOT a coal fired power plant! Is NOT experimental! And will NOT cause air pollution! To show support for this project, click here to complete an online form and send it to your federal and state representatives. On Feb 1, Gov. Christie signed legislation to help renew investment in Atlantic City. The steps taken by the Legislature and Governor will create much-needed construction jobs for our members. In addition to the thousands of jobs during initial construction phases, many direct and indirect jobs will remain after construction is complete. We encourage our members and the public to voice support with their elected officials for this project, which affects areas of Linden, Bayonne, Jersey City and Staten Island. To examine the facts and benefits this project will provide, visit the website:www.yesgaspipeline.org.